Jimmie Ray & Cyndi and Ring of Fire..
A Tribute to the Life and Legend of Johnny Cash & June Carter; the perfect show for many venues. Married and singing together since 1994, Jimmie & Cyndi have appeared as a duo, with one of their bands, or as special guest with other great bands, in a variety of venues: Festivals, Fairs, Community Events, Corporate & Private events, Clubs, Casinos, Radio, Television, the world famous Fremont Street Experience in Las Vegas, and most recently, NASCAR Races, Mojave Country Fair, Starbright Theater, an International Webcast via Deep Rock Drive; which a sample of can be seen via their website; and even more. Jimmie Ray has a background in most areas of Media and Entertainment. Born and raised in the shadows of the Great Smoky Mountains of North Carolina, then Arkansas, Tennessee, California, Oregon and Texas; spending years with the railroad; years as a corporate executive; being a published novelist – Mittie’s Song – a story of one woman’s courage; Jimmie’s diversified background shines through in his writing, music and performance – audiences know he has been there. He has lead several groups over the years; Folk, Rockabilly, Gospel, Bluegrass, American Roots. He spent five years in the 70’s touring 25 states, with over 1,000 appearances. Jimmie in so many ways relates with Johnny Cash; this Tribute was created purely from his heart. Cyndi Cantrell is a California girl with family roots in Louisiana and was raised on Old Style Country and Country Gospel Music. Cyndi has done everything from a Patsy Cline tribute at the Thomas & Mack for Hellderado Days with an audience of thousands, to duos with Jimmie and working with their various groups over the years. Cyndi also plays mandolin and harmonica. 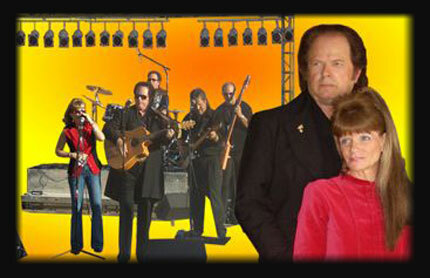 She especially enjoys their duets – from Johnny & June to their original music. In addition to being known for her costume changes, Cyndi has an unbelievable sense of humor, timing, character voices and loves bantering with Jimmie on stage. She loves to see people laughing, and she makes sure that they do just that. Wanna Book Jimmie Ray & Cyndi? You can book Jimmie Ray & Cyndi for your next event just by clicking the "Book Them Now" button to the right and filling out the form. We will be in contact with you about their availability as soon as possible.